As explained in several earlier posts, I bought regular bhut seeds from Hippy Seeds last year. So far I have grown what appear to be 2 or 3 varieties from this seed pack. I originally thought only two, but now there is a possible new development. So my reds, both garden and smaller pot, have smaller, pointier pods. These ripened from dark orange to red. Then I have yellows, which seem to stay yellow, and these have bigger fatter pods. 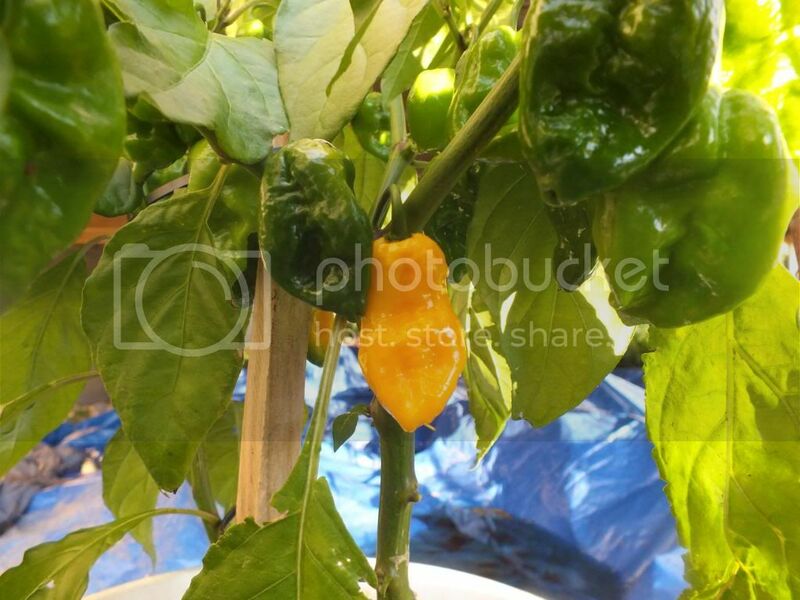 Earlier in the season I planted what I thought were habs into my garden, and they turned out to be bhuts. They have fat pods that eventually started ripening to yellow. Now they look like they are turning more orange. 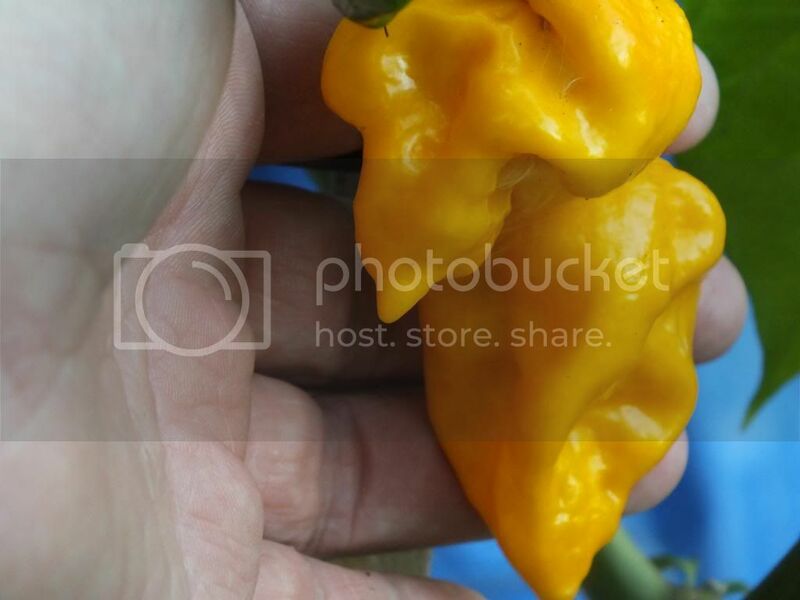 I thiought maybe because they are on a bushier plant that it was a trick of the light, but now I have compared them to my bucketed yellow bhuts and they are definately more orange in color. There is a possibility these might be Dorsets, but as this is my first year growing them I really don't know. I'm just going to leave both bucketed and garden plants on the plant for a while to see what happens. 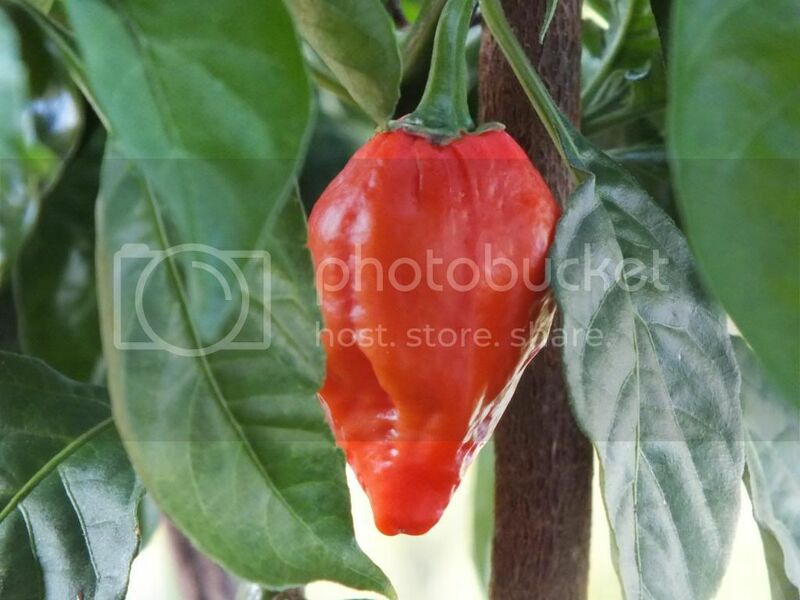 Does anyone know what Naga type pepper goes from yellow to orange then maybe to red? Or was I originally correct, and these things are weird shaped Habs? Maybe crosses from the original grower who originally supplied the grocery store? So many possibilities, it's like an Agatha Christie novel. 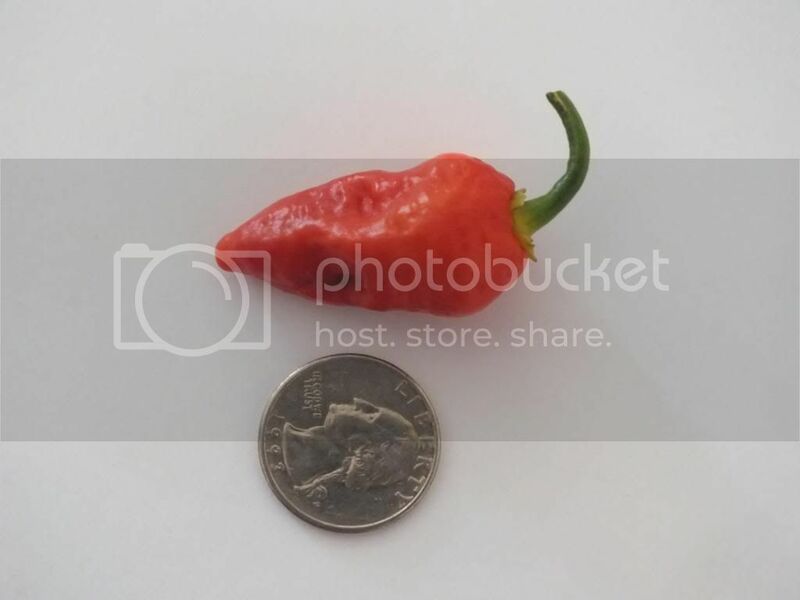 Here's a pointy red bhut. Little bitty. These are nice and fat and are pretty big. Not ripened yet, but not hab shaped. 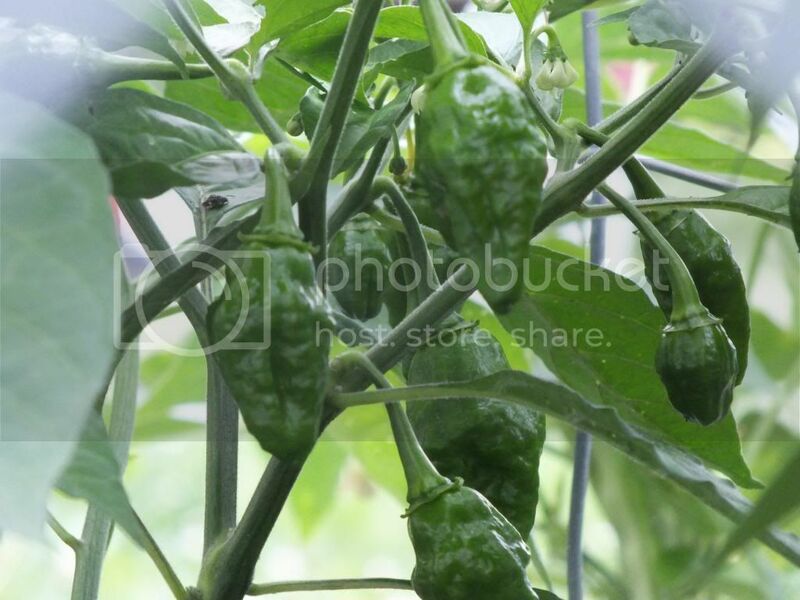 These are my garden "bhuts". This pic is a few weeks old, but there are some really big fat orange pods on this one. Edited by Pepperhead, 16 August 2013 - 09:22 PM. So about half of my plants have leaves that are turning completely yellow. With all the rain I have backed off my watering, and as a result backed off the feeding. This isn't just a few bottom leaves dropping, that I can handle, but the whole plant is just turning pale. I top dressed a few of them with compost the other day and even though it was sprinkling this morning, I watered in some tomato ferts hoping to stave off the impending deaths. Some plants are a nice green and flourishing, but my Butchies, one of my primos, my big orange hab plant, my big habby reaper, my big 7 Pot (which hates me anyway), my PK plant, red BS are dramatically more yellow in almost every leaf, and my tallest bubblegum is just starting to show it. Am I overreacting by adding the ferts? So the feeding seems to be helping a little. Bought some Ironite the other day, we'll see how things look in a week or so, then try that. Typical color of my red bhuts. It only reddens a little more after initial color change. 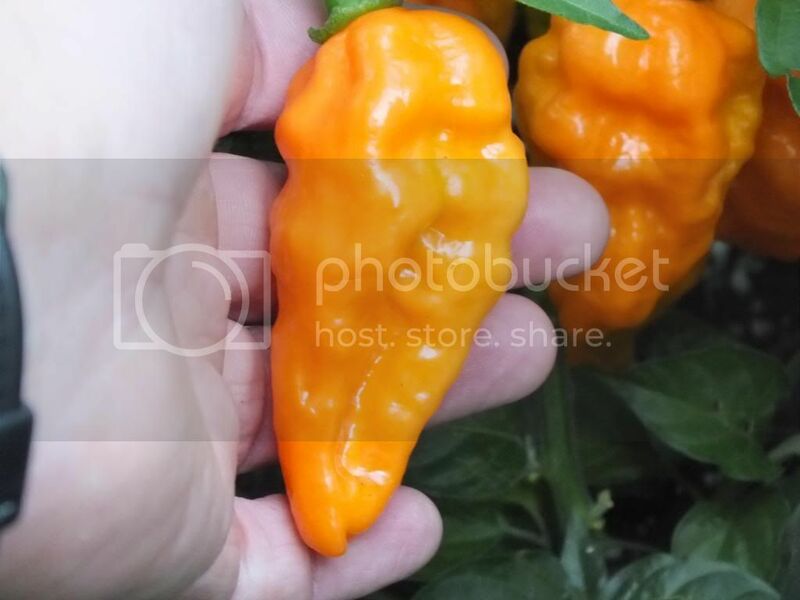 Weird hab, bhut, or dorset? Seems stalled at orange. These pods are on the same plant. And these are the yellows. All from the same seed pack, if they are all bhuts. Yellows and reds are for sure the same seeds pack. Edited by Pepperhead, 21 August 2013 - 06:58 PM. After a little research it would appear my seed source for my bhuts sells Red, Yellow, and Orange. Occam's Razor tells me they all got mixed up into one batch. 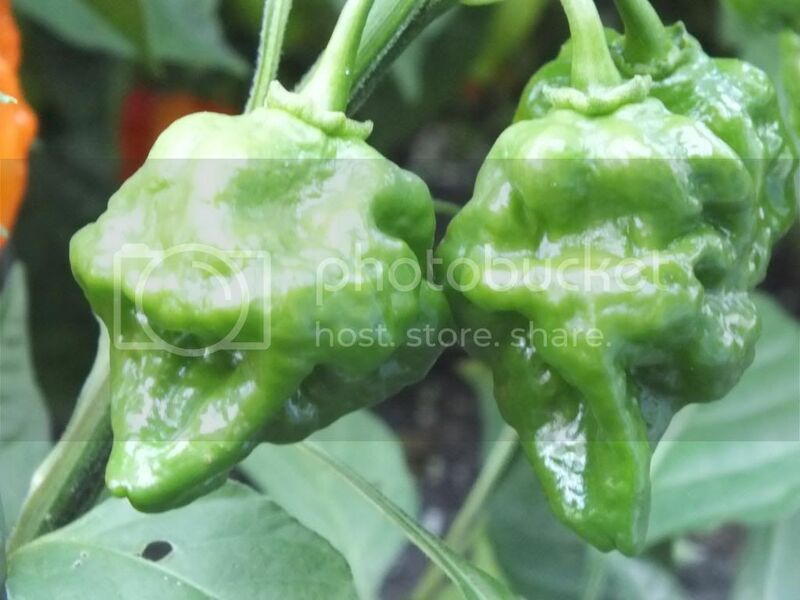 I have two 7 pot bubblegum plants, one has several pods on it, but they don't really look like the really cool ones I've seen with the big calyxes. The other has just popped it's first pod and does, form initial inspection, appear to have a larger than normal calyx. If so I'll be saving those seeds for myself and for trade. If the plant doesn't get many more pods, I won't have that many to trade. So hopefully, it'll kick into overdrive with the poddage soon. Time's running out. Holy Crap! I went away for the weekend and when I came back, everything was still alive! How could all my pepper plants survive without me looking at them for 36 hours? One more note, I found my first brain strain ripening today. With all the weird color combinations I've been getting I wouldn't be surprised if it ripened to blue. Time for an update. I've got a freezer full of peppers and I think I'll be deseeding and saucing this Friday. I need to pick up a dehydrator as well. Anyone know what a decent useable one goes for at Wallyworld? Pickled all my Lemon cukes and was hoping for enough to make sliced pickles and sweet relish, but I had to settle on just pickles. I was so looking forward to a sweet pickle relish with a bit of heat added to it. Might have to buy some grocery store cukes to get that done. Is it better to do a sauce with one or two varieties? Or do you think it will be good if I just throw them all in the pot and hope for the best? I was thinking of separating them into two groups, powder and sauce, and just call each mix "Shawn's Hot Mess sauce and powder". I love me some pineapple in hot sauce so I might add that. Will pineapple powder up well enough like the peppers if I dehydrate them? I should end up with more sauce than bottles so I guess it'll be back to the mason jars when I run out. Who wants to trade for sauce when they're done? So I was supposed to do hot sauces on Friday, but just did some tomato sauces instead. After work today I'll hit up the hot sauces. Already separated all the peppers into their individual varieties. Will deseed, then seperate into powder and sauce piles. Just got a Ronco dehydrater on clearance for about 27 bucks. I'm not sure if I'll do some mixed sauces, but I'll definately be making a pineapple hab sauce. Some of my Jonahs resemble some of my habs and vice versa so I hope I've seperated them correctly. Color is a match although the skin of the habs is more transluscent than the Jonahs, but that's harder to tell when they are frozen. It should work out. Good find on the dehydrator. Glad your raking it in on the harvest. Look forward to seeing how your sauces come out. Has anyone seen / done this cross before?